This is an archived version of a Tree of Life page. For up-to-date information, please refer to the current version of this page. 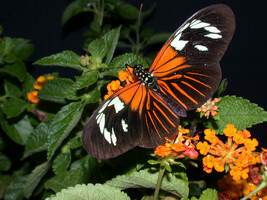 The Heliconius butterflies are the most speciose genus within the Heliconiini, displaying a dramatic diversity of colour patterns at species and sub-species level. They are also famous for Müllerian mimicry, with many species converging on a common wing pattern where they live together. Heliconius communities commonly consist of several ‘mimicry rings’, groups of species that share a common pattern. Colour pattern diversity of H. numata (top two rows), and H. melpomene (third row) with its co-mimic H.erato (bottom row). Heliconius butterflies have two unique, derived ecological traits that may have facilitated rapid adaptive radiation: pollen feeding and pupal-mating behaviour (Gilbert, 1972). Adult butterflies systematically collect pollen from flowers, which they masticate on the proboscis to dissolve out amino acids. This allows caterpillars to develop relatively rapidly (since they do not need to store nutrients for egg and sperm production), and allows adults to have a greatly extended lifespan – up to 8 months – in the wild. The pollen-feeding behaviour centres around a group of vines in the Cucurbitaceae, Psiguria and Gurania. This is a tight plant-pollinator relationship in which the butterflies are major pollinators for the plants and the plants major food resources for adult maintenance and egg production. 80% of a female's egg production come from amino acids that come from pollen she collects. Only 20% comes from amino acids acquired by the caterpillars feeding on passionvines. In most butterflies and moths, 100% of eggs derive from the efforts of the larval stage, and eggs are laid in a quick pulse after adult emergence. In Heliconius, eggs are laid as they are manufactured over the adult's long lifespan (Gilbert, 1972). The butterflies learn the locations of pollen plants and establish home ranges based on pollen foraging routes. It appears that the pollen plants are more significant than larval hosts in determining a female's assessment of the habitat. Thus, as long as she knows the locations of a network of pollen plants, she will stay in the area, even during periods when new shoots of passionvine hosts are temporarily not available due to weather or defoliation by Heliconius or other competing herbivores. So while most herbivorous insects disperse away when suitable ovipostion sites are scarce, Heliconius females are content to stay put as long as the mutualist plant produces pollen (which is year-round). Moreover the pollen promotes a long reproductive life so that females can wait many weeks for the opportunity to resume egg-laying (Ehrlich & Gilbert, 1973). A second unusual trait found in some Heliconius species is a unique mating behaviour known as pupal-mating. Males of certain species search larval food plants for female pupae. The males then sit on the pupae a day before emergence, and mating occurs the next morning, before the female has completely eclosed (Gilbert, 1976; Deinert et al. 1994). Various kinds of pupal-mating occur scattered across several insect orders (Thornhill & Alcock, 1993); in passion-vine butterflies almost half the Heliconius species (42%) are pupal-maters (Gilbert, 1991, pupal mating clade marked in the phylogeny). 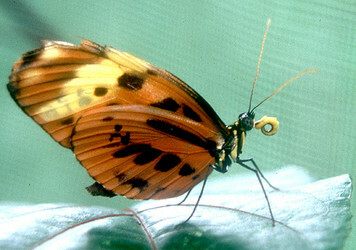 Gilbert (1991) suggested that pupal-mating might play an important role in the radiation of Heliconius as well as in the packing of Heliconius species into local habitats. Pupal-mating might enhance the possibility of intrageneric mimicry because in most cases, each mimetic species pair consists of a pupal-mating and a non pupal-mating species. The strikingly different mating tactics of these groups could allow phenotypically identical species to occupy the same habitats without mate recognition errors. Second, this mating tactic may influence host-plant specialisation, as it has been suggested that pupal-mating species may displace other heliconiines from their hosts by interference competition (Gilbert, 1991). 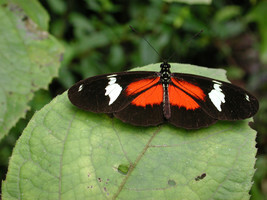 Males of these species sit on, attempt to mate with, and disrupt eclosion of other Heliconius species of both mating types. This aggressive behaviour may prevent other heliconiine species from evolving preference for host plants used by pupal-mating species. 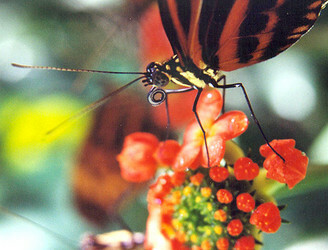 Heliconius are recognized by their large eyes, long antennae, characteristic elongate wing-shape, and distinctive colour pattern. The genus is found from southern United States throughout Central and South America and the West Indies, with the greatest diversity of species in the Amazon Basin (DeVries, 1997). The hostplants are all Passifloreae, and there is some phylogenetic association between species groups of Passiflora and the Heliconius species that feed on them (Benson et al., 1976) (see each species for more details). For discussion of the monophyly of the genus as presented here and relationships among heliconiine genera, see the Heliconiini page. Within Heliconius the relationships presented here are based on molecular sequence data for 3 mtDNA and 4 nuclear gene regions (Beltran et al. 2007). There is also a highly supported monophyletic ‘pupal-mating clade’ suggesting that pupal mating behaviour evolved only once in the Heliconiina (see tree above). Within Heliconius, the absence of a signum on the female bursa copulatrix is a character that defines the pupal-mating group (Penz, 1999). Heliconius butterflies show a continuum of geographic divergence and speciation; they are unpalatable and exhibit inter- and intraspecific diversification of colour and patterns. Bates’ classic paper (Bates, 1862), reflecting observations during his stay in the Amazon, showed a geographical pattern for the different colour forms: similar between species within any one area of the Amazon basin, but the mimetic colour patterns themselves changed every 100-200 miles. Beside this geographic divergence, closely related species within an area often belonged to mimicry “rings” (groups of unpalatable species, together with some palatable species, that have converged on the same warning colour pattern) (Mallet and Gilbert, 1995). Bates’ system has all the intermediate stages between local varieties, geographic races, and sympatric species that make it an excellent biological model to study selection at the species boundary. See maps attached to each species. Bates, H. W. 1862. Contributions to an insect fauna of the Amazon Valley. Lepidoptera: Heliconidae. Trans. Linn. Soc. Lond. 23:495-566. Beltr?n M, Jiggins CD, Brower AVZ, Bermingham E, Mallet M. 2007. Do pollen feeding, pupal-mating and larval gregariousness have a single origin in Heliconius butterflies? Inferences from multilocus DNA sequence data. Biological Journal of the Linnean Society in press. Beltr?n M, Jiggins CD, Bull V, Linares M, Mallet J, McMillan WO, and Bermingham E. 2002. Phylogenetic discordance at the species boundary: comparative gene genealogies among rapidly radiating Heliconius butterflies. Mol. Biol. Evol. 19: 2176-2190. Benson WW, Brown KS, Gilbert LE 1976. Coevolution of plants and herbivores: passion flower butterflies. Evolution 29, 659-680. Brower AVZ, and Egan MG. 1997. Cladistics of Heliconius butterflies and relatives (Nymphalidae: Heliconiiti): the phylogenetic position of Eueides based on sequences from mtDNA and a nuclear gene. Proc. R. Soc. Lond. B 264: 969-977.Brown KS, Jr. 1981. The biology of Heliconius and related genera. Ann. Rev. Entomol. 26: 427-456. Deinert EI. Longino JT, Gilbert LE. 1994. 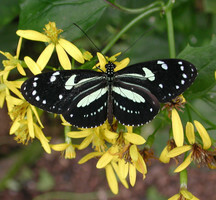 Mate competition in butterflies. Nature 370: 23-24. Ehrlich PR, Gilbert LE. 1973 Population structure and dynamics of the tropical butterfly Heliconius ethilla. Biotropica 5: 69-82. Emsley MG. 1965. Speciation in Heliconius (Lep., Nymphalidae): morphology and geographic distribution. Zoologica NY 50: 191-254. Gilbert LE. 1972. Pollen Feeding and Reproductive Biology of Heliconius Butterflies. Proceedings of the National Academy of Sciences of the United States of America 69: 1403-1407. Mallet J. Singer MC. 1987. Handling effects in Heliconius: where do all the butterflies go? J. Animal Ecology. 56: 377-386. "Muses." Encyclopedia Mythica from Encyclopedia Mythica Online. http://www.pantheon.org/articles/m/muses.html [Accessed May 22, 2008]. Penz CM. 1999. Higher level phylogeny for the passion-vine butterflies (Nymphalidae, Heliconiinae) based on early stage and adult morphology. Zoological Journal of the Linnean Society 127: 277-344. Turner, J.R. 1976. Adaptive radiation and convergence in subdivisions of the butterfly genus Heliconius (Lepidoptera: Nymphalidae). Zoological Journal of the Linnean Society 58(4): 297-308. Los Heliconiini (Lepidoptera, Nymphalidae) de Venezuela . An excellent resource for Venezuelan species. Heliconius phylogeny homepage. Photos and data from our Heliconiine phylogeny study. James Mallet homepage. 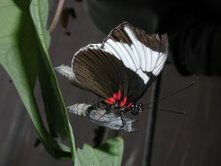 Information on mimicry and Heliconius in general. Owen McMillan Lab. Mapping colour pattern genes in Heliconius erato. Insect Flight Research. Butterfly flight , including mimicry in flight patterns. L.E. Gilbert homepage. Ecology and behaviour. Briscoe Lab. Molecular evolution of eye pigment genes . Page: Tree of Life Heliconius Kluk 1780. Heliconius Latreille 1804 invalid junior homonym, Migonitis H?bner 1816 invalid junior homonym of Migonitis Rafinesque 1815 (Hymenoptera) , Sunias H?bner 1816 currently viewed as a subjective junior synonym, Ajantis H?bner 1816 currently viewed as a subjective junior synonym, Apostraphia H?bner 1816 junior objective synonym of Heliconius, Sicyonia H?bner 1816 suppressed, ICZN Op. 382, Heliconia Latreille 1818 emendation, Laparus Billberg 1820 currently viewed as a subjective junior synonym, Crenis H?bner 1821 currently viewed as a subjective junior synonym (of Laparus), Phlogris H?bner 1825 junior objective synonym of Sunias, Podalirius Gistel 1848 invalid junior homonym of Podalirius Latreille 1802, Blanchardia Buchecker 1880 invalid junior homonym of Blanchardia Castelnau 1875. Authored by Margarita Beltr?n, Andrew V. Z. Brower, and Chris Jiggins. The TEXT of this page is licensed under the Creative Commons Attribution-NonCommercial-ShareAlike License - Version 3.0. Note that images and other media featured on this page are each governed by their own license, and they may or may not be available for reuse. Click on an image or a media link to access the media data window, which provides the relevant licensing information. For the general terms and conditions of ToL material reuse and redistribution, please see the Tree of Life Copyright Policies.